IRISH PEOPLE HAVE been warned to avoid any non-essential travel to Gambia in the west of Africa as political unrest and turmoil takes hold. The Department Of Foreign Affairs has issued a travel advisory for Gambia, telling people to avoid travelling there if possible. “Since the presidential elections in December 2016, there is an ongoing political and security crisis in the Gambia,” the travel advisory reads. “It is possible that there will be external military intervention and further civil unrest. Irish citizens in the Gambia should carefully consider their need to remain in the country. There is no dedicated Irish Embassy or Consulate in Gambia so the DFA said it is “limited in the help” it can offer citizens. The warning from the DFA comes as troops from Senegal backed by other West African nations are set to enter Gambia. The troops are poised to enter as President Yahya Jammeh refused to leave office, ignoring a midnight deadline to stand down or face military action. President Jammeh has steadfastly refused to leave office after losing elections last month to Adama Barrow, prompting west African states to ramp up pressure on the president following weeks of failed diplomacy. His mandate ended as of midnight last night, but the former leader has refused to leave. Nigeria sent troops and fighter jets to Senegal, whose own forces massed on the Gambian border last night. Jammeh’s army chief said his troops would not fight against their entry into the country, as the Mauritanian president flew out of Gambia following hopes of a last-minute deal to convince Jammeh to hand over power. Incoming president Barrow and his team maintain his inauguration will go ahead today on Gambian soil, and his spokesman said late Wednesday “we do not feel any threat” from Senegalese troops on the ground. However, the inauguration’s head organiser James Gomez said plans for the transfer of power in a huge stadium outside the capital were now cancelled. Jammeh announced a state of emergency on Tuesday, saying it was necessary because of interference from foreign powers in the country’s 1 December election, but the declaration has had little effect on attempts to remove him. The country’s vice-president Isatou Njie-Saidy resigned Wednesday, family sources said, along with the environment and higher education ministers, in the latest of a string of cabinet members deserting Jammeh’s government. The UN Security Council is scheduled to meet today to adopt a statement on West Africa that will reaffirm the demand for Jammeh to hand over power, diplomats said. 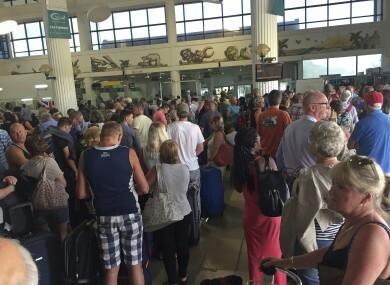 As tensions rose over the past number of days, Britain and the Netherlands issued travel advisory warnings, with around 1,000 British tourists expected to leave on special flights on yesterday alone, leaving the small airport near Banjul struggling to cope. The panic caused by the state of emergency could prove financially devastating for the country – experts say up to 20% of the economy relies on tourism. Gambians were taking precautions and stocking up on food and supplies in the few shops that remained open in districts near the capital, with roads quiet and street hawkers notably absent. A source told AFP that patients at Banjul’s Edward Francis Small Teaching Hospital, which sits opposite Jammeh’s seat of power, were removed for security reasons. Only those in intensive care remained. The DFA said advised travellers to contact the Irish Embassy in Abuja in Nigeria in case of an emergency. Email “Irish people told to avoid Gambia as West Africa troops prepare to move in”. Feedback on “Irish people told to avoid Gambia as West Africa troops prepare to move in”.